Numerous researchers in the University of Wisconsin–Madison Department of Biochemistry perform in vivo biochemical studies. Meaning “within the living,” these studies focus on understanding a particular molecular process in the context of an entire organism rather than isolating it in an artificial tissue, culture cell, or test tube, called in vitro. The two methods of scientific experimentation are powerful and each has its advantages and disadvantages, but with the advent of gene editing technologies such as CRISPR, the in vivo studies are cracking open exciting new ways to understand what’s going on at the genetic and molecular levels in organisms. These researchers use model organisms, such as the fruit fly Drosophila melanogaster — like in the lab of Assistant Professor Jill Wildonger — and Caenorhabditis elegans, a microscopic worm — like in the lab of Professor Judith Kimble. These organisms allow scientists to study fundamental processes in vivo and make inferences about how those processes work in larger organisms like humans. Other faculty members who are performing in vivo studies include professors Wes Pike and Alan Attie, who use mice as a model in their research. They study areas like vitamin regulation and diabetes, respectively. In vivo can also be interpreted to mean work in an entire bacterial or fungal cell, as is the case with Associate Professor Aaron Hoskins’ work in yeast. In this Q&A, biochemistry faculty Kimble and Wildonger share what this type of study entails both broadly in the department and in their research. Q: What model organism do you use in your research and what kind of research does your lab perform? Kimble: Very broadly, my lab tackles basic questions in animal development. C. elegans has the same basic tissue types as a human, but the entire animal is made up of only about 1000 cells, it has a three-day life cycle for super-fast genetic manipulations, and it is transparent for powerful imaging. The secrets for how an animal cell makes a neuron or a muscle or a germ cell are approachable. My lab’s particular focus is understanding the molecules and networks that regulate how stem cells create a tissue. Wildonger: We are looking at how proteins, organelles, and molecules move around in neurons and get to the right place at the right time. We use Drosophila, or fruit fly larvae, for this work because it gives us the chance to look at how motors and their cargos are localizing within neurons in an intact organism and that’s very difficult to do in, say, a very fuzzy mouse. Q: Why are in vivo studies so useful and powerful in your research? Kimble: When we started our studies in the early 1980s, no one in the world knew much about what molecules regulate animal development. Our genetic scalpel together with molecular biology allowed us, and others taking essentially the same approach, to find many important molecules for the first time. 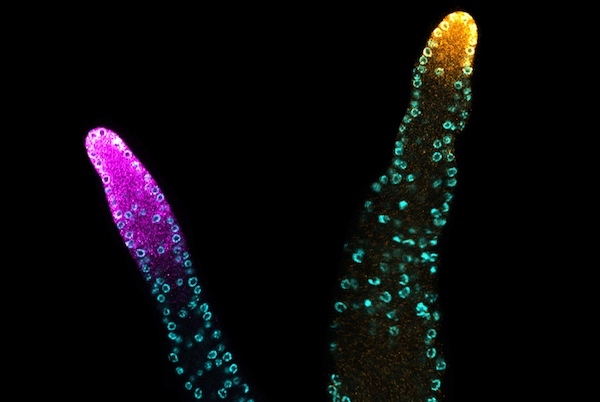 And remarkably, molecules we found to control stem cells in worms also control them in humans and can cause a variety of human diseases, including cancer, when they go wrong. The real breakthrough was addressing these key questions in a simple and tractable creature. Now with CRISPR, we can engineer precise mutations and take our in vivo understanding to a whole new level. CRISPR has been revolutionary — we weren’t able to do this only a few years ago and it’s phenomenal. Wildonger: The fruit fly larvae are transparent so we can look directly at the neurons and their cargos. Some people are working with mammalian neurons instead of flies’ but most of those have to be taken out of the cell and cultured in a dish. But then you lose the in vivo context. What you are seeing in the dish might not be what’s actually happening in the complex cell. We also have a lot of genetic tools like CRISPR that allow us to make precise genetic edits and see their effects in vivo in flies. We can really understand how the motors are functioning in neurons in real time in an intact organism. Q: How do in vivo and in vitro studies complement each other? Wildonger: We find this model organism so attractive because it’s not just for looking at things in vivo but it’s also a system where we can grow the fruit flies up to a level where we can purify proteins to look at them in a purified system. It’s a combination of being a great system for looking at proteins and how they are functioning in an intact cell or organism but we can also extract the proteins and work on them in vitro. So the flies are in this kind of sweet spot. I think it's really important to study proteins in their native environment. That’s where it can be very powerful to couple cell biology with purified systems and biochemistry. That’s why our lab and many others in the department are pursuing these experiments. microscope. Photo by Robin Davies. Kimble: We go back and forth from studies in vivo to others in vitro. We’ve crystallized proteins, identified key residues that are important for protein-protein interactions, built macromolecular complexes, and learned how these proteins work together in the cell. For molecules that govern cells and organisms, it is critical to test whether in vitro results are valid in vivo. CRISPR makes that possible. You need both approaches. Exquisite measurements made outside the organism may not be relevant in the context of the whole cell or organism. The two approaches really complement each other. Q: Do you feel an affinity for your model organism after studying it for many years? Wildonger: Of course, I think the flies are cool. When I look at any organism, I’m always thinking about how they are perceiving the world through their nervous system. How is it taking in external stimuli? How is it generating a response to that stimuli? I enjoy working with fruit flies but I’m curious about any organism, really. Kimble: Well yes, of course I love my little worms. They have opened many doors and told me their secrets. I’ve been working with C. elegans since graduate school and that was before the first publication on them came out. The research we are doing now — I could not have imagined when I started out. microscope in the lab's "fly room." Photo by Robin Davies. Q: What are some implications of your work? Kimble: Understanding stem cell regulation has important implications for basic science in virtually all organisms and major implications for human diseases where stem cells go awry, like cancer. The human homolog of one of our favorite proteins was found a couple years ago to be important for controlling neural stem cells and defects in that protein can also cause human epilepsy. We had known for some time that our work had implications for human stem cells and cancer, but we are just beginning to learn how broadly they affect human health. Wildonger: We want to understand really broadly the basics of how neuron structure is established and maintained and how molecules inside those neurons get to the right place at the right time. Getting at this in fruit flies will help us better understand this in humans. One of the proteins we work with in the flies is 97% similar to the one in humans. Also, when there are problems in neurons, disease can occur. A number of diseases, such as Alzheimer’s, are linked to dysfunction of this transport system.